Cathryn and I were lucky enough to be spending the day headed out to sea for some pelagic birding with Zest for Birds. We were both extremely excited to be introduced to a world that we had not yet experienced, a world of Petrels, Skuas, Albatrosses and more. It was up and at ’em at 05:00 on Sunday, as we would be driving through from Kenilworth to Simon’s Town, where the boat would be departing from at 07:00. We got to the jetty where we would be boarding from, the sun still slowly erasing the night from the sky as it crept further into the sky. We were the first ones to arrive, but a few minutes later a couple arrived who were also clearly there for the pelagic, this was then followed by a few more people. Then a familiar face appeared, Peter Ryan joined in the group; I had not met Peter Ryan before, but have seen his name and photo on most of my field guides – so I knew exactly who he was. A few more passengers arrived over the next few minutes. Then it was another familiar face, that of John Graham – who I had not seen since we both sat in an open field in Klipheuwel for 4 hours looking for the Great Spotted Cuckoo. The third familiar face was Trevor Hardaker, once he arrived John began with the pre-trip safety instructions and passing around the indemnity form. Zest for Birds seems to have an all star guiding group, with the biggest names in South African birding all serving as guides at times. The birding then began in the harbour with Cape Cormorants, Hartlaubs Gulls, Kelp Gulls, Grey Herons, Swift Terns and a single Grey Headed Gull all present before we stepped on the boat. After boarding, we were given a short talk about safety, and then it was off to sea – but not before a quick detour back to the jetty to pick up Rob Leslie, another one of the guides – with over 1000 hours at sea under his belt. The boat was an extremely comfortable size, with a cabin to stow ones bags and valuables in and an ideal area of seating on a raised deck. We began to move just off the coast from Simon’s Town to the direction of Cape Point, giving a new perspective on the Cape coastline. A few seconds out John pointed out to the group some Bank Cormorants near the shore, followed a few minutes later by Trevor pointing out 3 adult Cape Ganetts. The sea was flat with only slight swell, and no wind – it was a perfect day to be heading out to sea. We continued moving ahead, passing adjacent to the Cape of Good Hope nature reserve. About 30 minutes later, we passed the tip of Cape Point and began our journey out into the open waters to the south-west. It was another 30 minutes or so before we saw our first real pelagic bird. 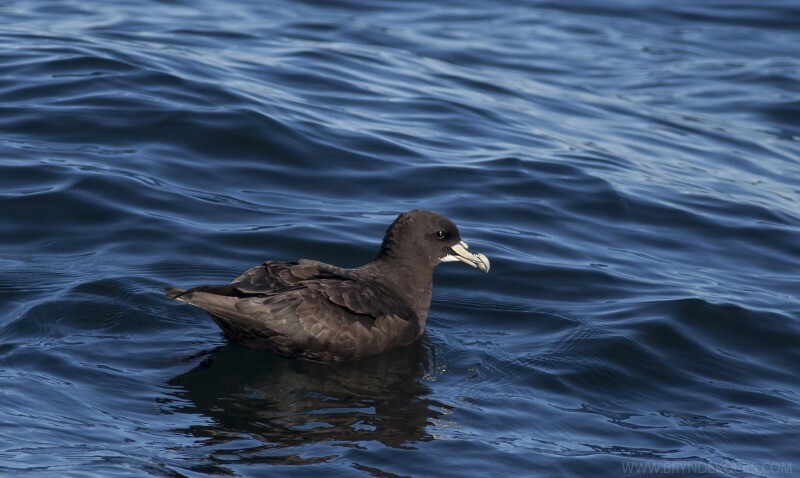 A White-Chinned Petrel sat on the water about 20 meters from the boat, bobbing around in the light swell. 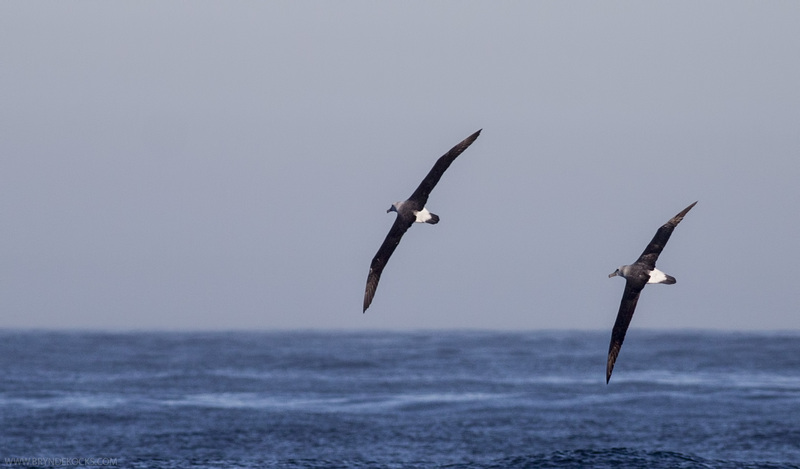 The birds were then starting to become more prevalent, another 5-10 White-Chinned Petrels showed up in the next 10 minutes, followed by a couple of adult Shy Albatrosses; the wing span of the Albatross is really something else and a sight I had longed for since I began birding. 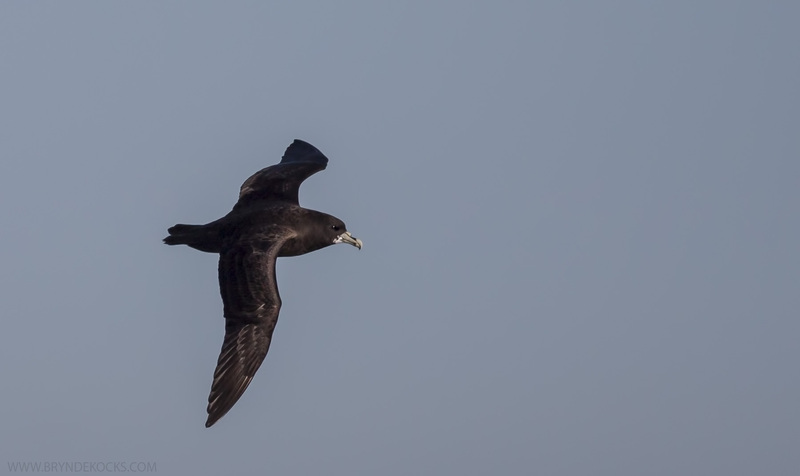 A few more Shy Albatrosses and White-Chinned Petrels showed up, followed by occasional close fly-bys from both European and Wilson’s Storm Petrels. These Storm Petrels were a species that I had never actually read about properly before and had no idea that they were so small. They felt very much like the Swifts or Swallows of the sea, probably as large as one’s hand. Then came a few rather excited calls by the guides of a Manx Shearwater, which only gave us a short view before disappearing into the endless horizon again. Excitement then turned to the chaos in the waters ahead. 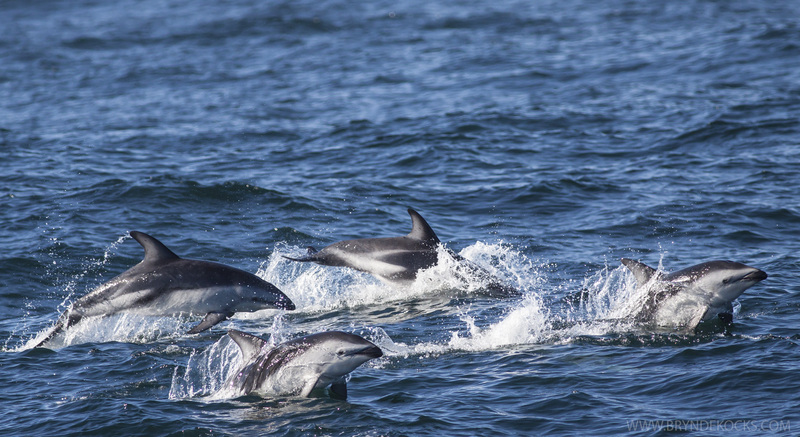 There was some activity in the distance and we managed to catch up with a pod of hundreds of Dusky Dolphins. They were absolutely everywhere, and it was actually difficult to get photographs with a longer telephoto lens because they were literally right up against the boat, though at the same time they stretched far into the distance too. But the skipper had positioned us well and we were able to watch as they approached the boat and passed by. It was an unbelievable and unforgettable sight for everyone on board. It was soon time to move on though and we passed through a relatively quiet area for the next hour or so, but for us pelagic virgins there were still common lifers to be found. Both Sooty and Cory’s Shearwaters passed by the boat. 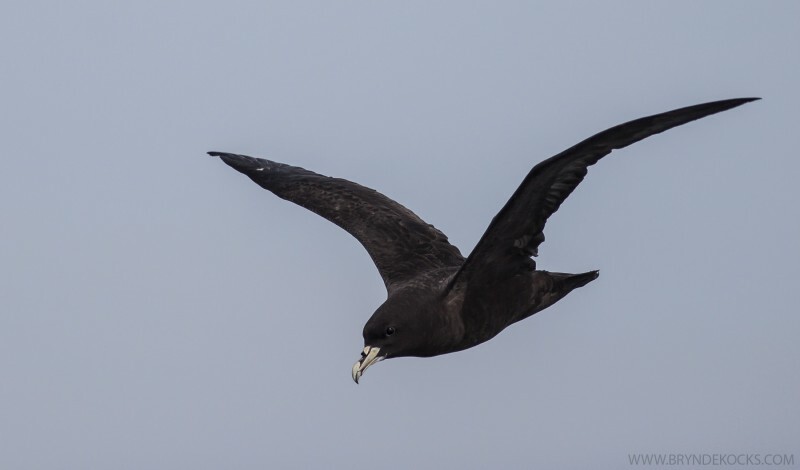 A few Sub-Antarctic Skuas also passed by, usually coming directly over the boat. 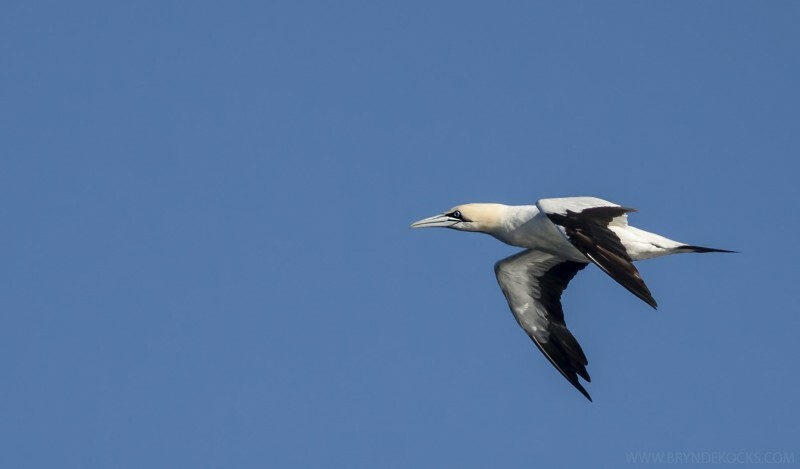 Cape Gannets were also passing by regularly. An unusual sight, at least an hour off the coast was a lone Hartlaub’s Gull, a far way from home. At this stage Cathryn was already feeling a bit dizzy and sea sick, so she went to the back of the boat and spent a bit of time in the cabin there, moving back out onto the deck and watching the rest of the day from the back of the ship, where she felt it easier on her stomach. It was then on to finding a trawler, or in this case a long liner. We had caught sight of one in the distance and began making our way in that general direction, it was at this point where we were treated to some sandwiches and a cold drink, just what was needed. While heading towards the fishing vessel, we made a quick detour at request of one of the guides who had seen a group of Shearwaters in the distance. 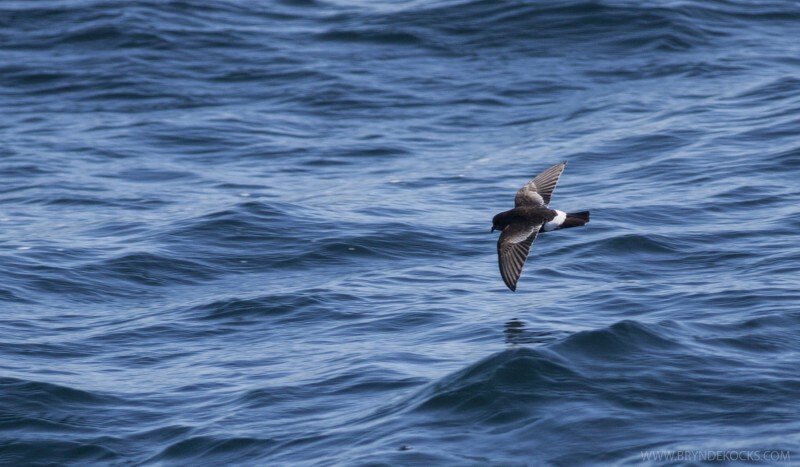 We approached the group which consisted of mainly Corey’s and Great Shearwaters. 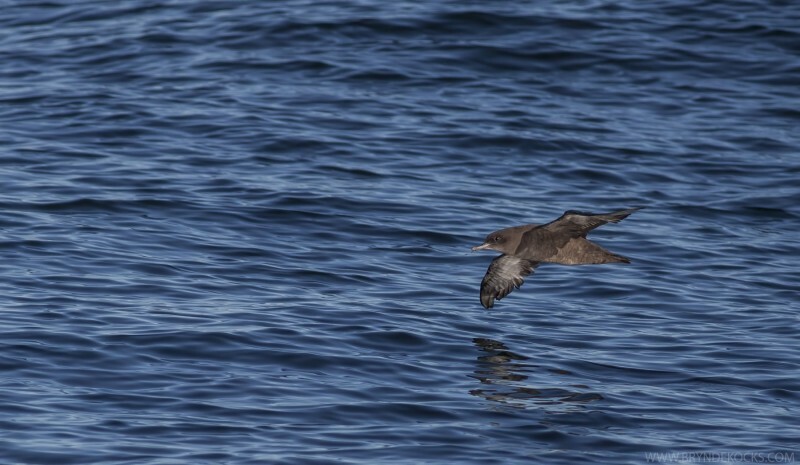 An interesting question is – according to the new split on the Cory’s Shearwater – would these be the Cory’s Shearwater or would they be the Scopoli’s Shearwater. Something to look into further when the next checklist is released. Great Shearwater having swallowed a hook. We then got near to the long liner and trailing in its wake were a group of Albatrosses, Petrels and Shearwaters. We made a stop and the guides pointed out the two Black-Browed Albatrosses in the ground, the others being both adult and immature Shy Albatross. The Black-Browed Albatross seemed to enjoy the attention and floated right up next to the boat, allowing everyone on board a great view and some close up photographs. We then continues to follow in the wake of the fishing vessel, when probably the only real downer of the day occurred. 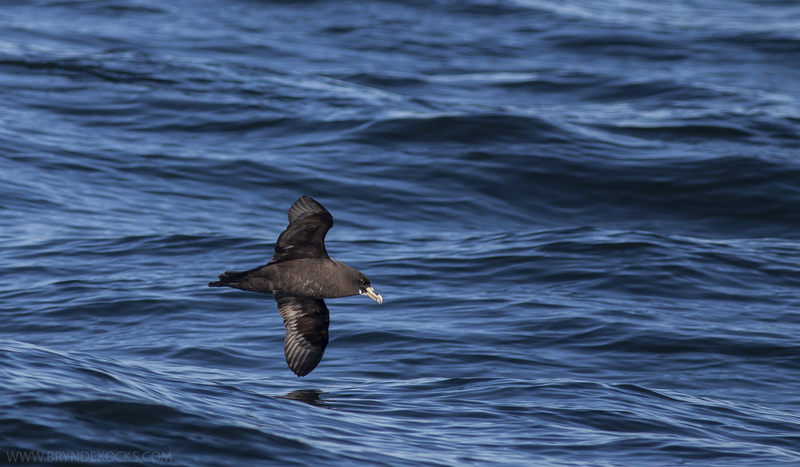 We saw a Cory’s Shearwater land, with a fishing line extending from out of its bill. It appeared as though the poor guy had obviously swallowed a fisherman’s hook, even though only displaying signs of discomfort once (as captured), it was something that was difficult to look at and further re-enforced my dislike for fishing. 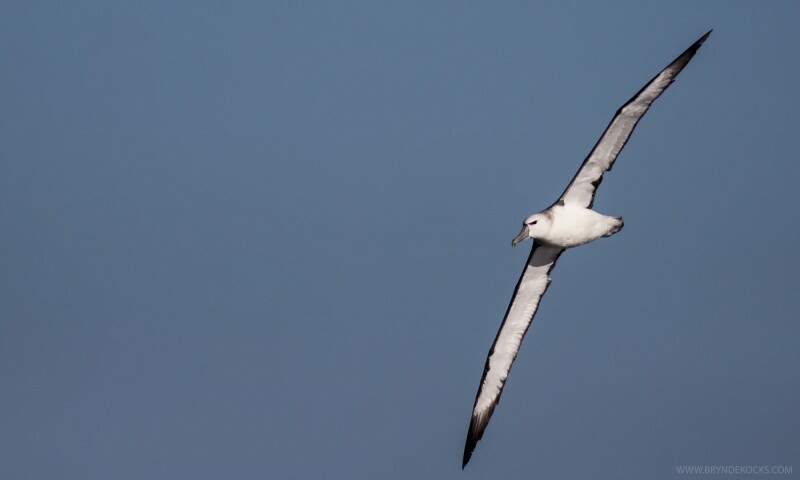 Peter Ryan mentioned though, that these Shearwaters have the ability to actually digest the hooks, and then when that occurs, the line will often come out. At this point we had a few Sub-Antarctic Skuas that kept passing over the boat, Wilson’s and European Storm Petrels flying alongside the boat, Shy and Black-Browed Albatross around. 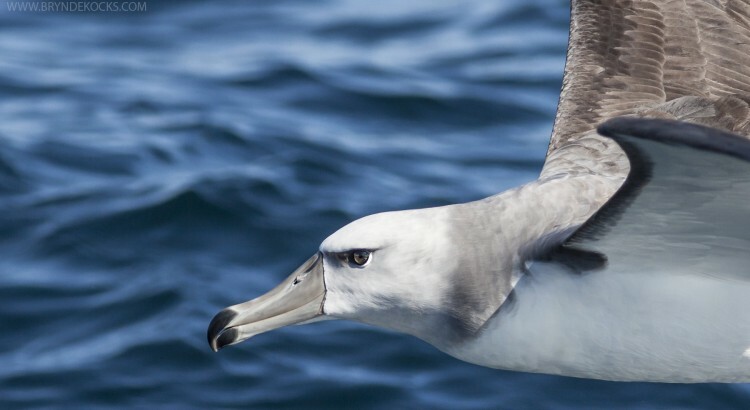 A pair of two Northern Giant Petrels joined in the feeding in the long liner wake and a couple of Indian Yellow-Nosed Albatrosses also showed themselves, alongside the long liner. One of the Albatrosses had a clearly injured leg which looked to have possibly been caught in some kind of string. After a while of following the long-liner with no new additions of species, we began our trip back to shore. On the way back we continued to see the occasional Shy Albatross and White Chinned Petrel. And just when it was looking as though that would be our final tally of species for the day, John Graham pointed out a Pomarine Skua in the distance. It was now around 15:00, so 8 hours at sea, and we were approaching Cape Point. Along the route back, adjacent to the coast, we came across two Sub-Antarctic Skuas, a mere few hundred meters from the coast, and again we were back to a world of Kelp and Hartlaub’s Gulls. We made a short stop at one of the boulders to get closer visuals on the Bank Cormorants, with their fascinating eyes that glow a colour of – well, who knows what colour that is. When approaching the harbour, I had a short chat with Trevor about some of the birds of the day and he was mentioning how the Albatrosses don’t go back to land for years after leaving once they fledge. It’s unbelievable to think that these first were born thousands of kilometers away and will again one day likely return there to breed. Now that’s some reliable GPS they have. It was an unbelievable day, and I can honestly thoroughly recommend Zest for Birds to anyone who is looking at doing a pelagic trip around Cape Town. The knowledge and skill of the guides is unbeatable and the birding itself is equally unmatched. I have no doubt that this will not be my last pelagic trip, in fact it’s less than 24 hours later and I’m already missing the ocean. I know there’s a whole lot of rarities out there on those open waters, just waiting to be located. This trip also brought me past the 200 mark for my Western Cape list. This being my first time seeing almost all of these birds, I hope my IDs are correct. Next time, I’ll be setting my sights on the Pintado Petrel and hopefully a few more rarities. Truly an unforgettable day, and I’m always so happy to read your posts, since your memory is so much better than mine – takes me right back to every single moment experienced. Once again Bryn, some fantastic shots. What a wonderful trip. Devastating though, to see the bird with the hook in its mouth. I too, hate fishing. The dolphins………..what a sight. WHAT CAN I SAY BRYN? YOU MUST HAVE HAD A SUPERB DAY AND YOU ARE PROBABLY ON CLOUD 9. I WOULD BE ANYWAY! WHAT STUNNING SIGHTINGS! HI TIME I WENT ON A PELAGIC TOO.